"Amateur Radio was there to generate interest for our STEM-rich activity." 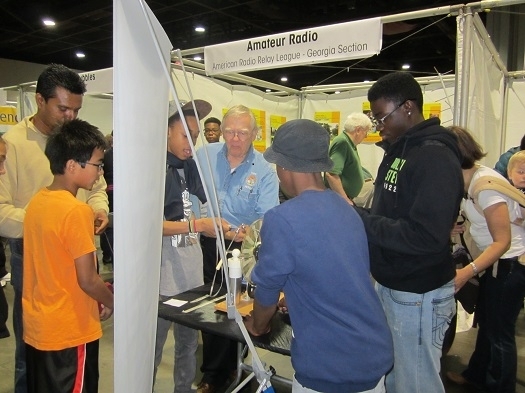 On Saturday, March 29, 2014, the Georgia Section of ARRL hosted a booth at the Atlanta Science Festival Exploration Expo, the grand finale of a weeklong celebration of STEM (Science, Technology, Electronics, and Math) activities. Over one hundred booths filled Hall 3 of the Georgia World Congress Center in downtown Atlanta and featured nearly every type of STEM activity available. Among the disease detectives, oobleck slime, math-modeling bubble makers, and insect devouring “killer” plant botanists, Amateur Radio was there to generate interest for our STEM-rich activity. An estimated 16,000 visitors attended the Expo, which had been moved indoors from Centennial Olympic Park due to the inclement weather. With financial support from HamJam (a cooperative between SouthEastern DX Club and North Fulton Amateur Radio League, which uses proceeds from their fall event to promote youth in Amateur Radio), a main focus of the Amateur Radio booth was to introduce teachers to resources they could use to enrich their STEM curriculum by incorporating ham radio and related electronics in the classroom. Jim Stafford, W4QO, and Georgia Section Manager Gene Clark, W4AYK, attracted passersby to the booth and generated a charge with the younger crowd with a Wimshurst electrostatic generator. Norm Schklar, WA4ZXV, John Kludt, K4SQC, Wes Lamboley, W3WL, and Mike Weathers, ND4V, guided guests into the booth to watch their voices on an oscilloscope, see a Tesla coil in action, watch the video of last fall’s ARISS Radio Contact at Mill Springs Academy (Alpharetta, GA), track satellites as they passed over Atlanta, and spell their names out in Morse code. Martha Muir, W4MSA, Section Youth Coordinator, spoke with teachers and students about supplementing their classroom activities with Amateur Radio. “I didn’t know they still used Morse code” was one comment made by a guest entering the booth (but not as she left). Some hams attending the Expo said they were glad to see Amateur Radio displayed at this science rich venue; other visitors who had been hams “years ago” were excited to talk about getting involved with the activity again. Our curious visitors learned about the steps needed to get a license and about all the different specialty interest areas of Amateur Radio. Connections were also made with booth presenters from Agnes Scott College, where a number of folks recently earned their licenses. As a follow-up activity to the Atlanta Science Festival Exploration Expo, the North Fulton Amateur Radio League also sponsored a workshop for teachers entitled “Enriching Your STEM Curriculum with Ham Radio” at Mill Springs Academy in Alpharetta in early May. More on the Atlanta Science Festival Exploration Expo can be found at http://atlantasciencefestival.org/expo; for more information on HamJam visit http://www.hamjam.info. Author's note: All of the above named participants are members of the Georgia Section of ARRL. Jim, Wes, and John were the member representatives from the North Fulton Amateur Radio League. Norm and Mike were the member representatives from the Southeastern DX Club. The funding for this booth came from the proceeds of "Ham Jam," which is a joint venture of both of those clubs.